Join us in celebrating 25 years as an independent agency. On June 11, 1993, then Gov. David Walters signed Senate Bill 356, establishing the Oklahoma Department of Rehabilitation Services. Its passage was evidence of the state of Oklahoma’s commitment to provide more effective consumer responsive services for its citizens with disabilities. 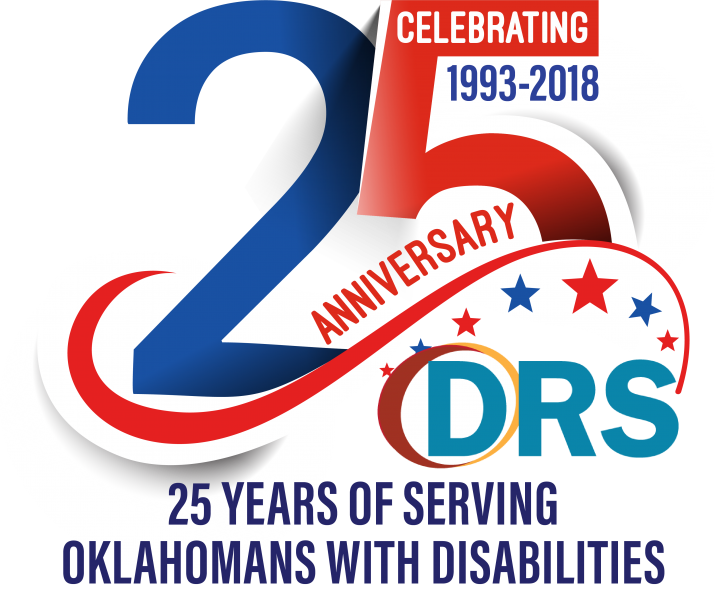 DRS was established to serve many of the major programs important to the disability community including Rehabilitation Services, Visual Services, Oklahoma School for the Blind, Oklahoma School for the Deaf and the Disability Determination Services. Each year, the United States Senate recognizes March 22 as National Rehabilitation Counselor Appreciation Day. Commissioner Emily Cheng and I recognize those who have chosen this profession. As a former vocational rehabilitation client and counselor, I (Commissioner Cheng) have been on both sides of your desk. We sincerely appreciate your commitment to successful employment of Oklahomans with disabilities. You enable and inspire jobseekers to reach their goals for economic independence and an improved quality of life. In Oklahoma, we continue to recognize your master’s-level rehabilitation counseling education and professional certifications as valued credentials that document your dedication to this rewarding career. You and the administrative and professional staff on your team truly make a difference in our state. SULPHUR, Okla. –– Oklahoma School for the Deaf recently hosted an American Sign Language Immersion Camp, which brought ASL to life for 164 students learning sign language at six high schools and seven colleges. Students from two high schools and one college in Texas participated in the two-day training at OSD’s campus in Sulphur. OSD’s camp was a sign only event, which challenged students to communicate without using their voices. Check out the flyer and share with all your friends. This media release was originally released on Oct. 13, 2006. DRS has been empowering Oklahomans for 25 years. AGRA, Okla. -- 1956 -- the year that Elvis Presley’s first single hit the music charts and President Dwight D. Eisenhower authorized adding “under God” to the “Pledge of Allegiance” – was also the year that Dale McFarlin opened his snack bar business on Main Street in Agra, Oklahoma. A native of the small central Oklahoma town, 30-year old McFarlin returned home with his wife Helen and young son Jim, preferring the simplicity of small town life to the faster pace in Enid where they had previously lived. Dale McFarlin liked Agra so well that he stayed in business in the same white, clapboard store in the same town for the last 50 years. The townspeople who can’t imagine life without him assume that’s a record. MUSKOGEE – Thirty students from across the state are pre-registered to compete at Oklahoma School for the Blind’s 17th annual Oklahoma Regional Braille Challenge on Thursday, March 7 in Muskogee. The contest will take place from 9 a.m. to 2:30 p.m. on the OSB campus at 3300 Gibson Street. Braille Challenge is a national program of the Braille Institute of America in Los Angeles, which is celebrating its 100th anniversary this year.